One of my passions as a musician, singer and writer, has always been to encourage people’s skills, whether they are young, old, experienced or absolute beginners. Warming up – how to incorporate breathing patterns, and vocal preparation techniques into your practice to develop , and nurture, the voice. range, pitch, projection, tonal variety, articulation and interpretation and communication of songs. performance - the ‘right to be there’and building confidence. 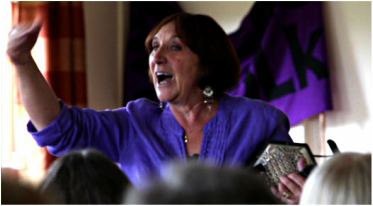 Traditional singing style – how folk songs have been sung, looking at the use of tone, ornamentation and other tools which the old singers used to communicate the songs and ballads of these islands. These workshops include listening to field recordings made in England, Scotland and Ireland analysing and emulating those old styles of singing as part of the development towards ‘making a song your own’. Also advice on building a repertoire. 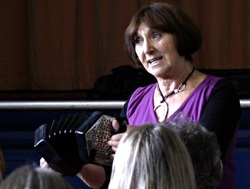 Much of the training is based on the work I undertook as a tutee of Ewan MacColl – which in turn he based on the vocal training given to actors in Theatre Workshop, including the ‘Laban theory of efforts' which Ewan translated from dance and used in voice training. He also used the techniques of Stanislavsky (Application of the idea of ‘If’ to a role) as just one means of understanding identification with character and situation in for instance the English and Scots classic ballads. Technique – touch, energy and attack, ‘telling the tunes’ , use of dynamics and ornamentation, interpretation and playing with sensitivity. Tune making – using the traditional folk tunes of these islands as role models for creating new pieces. This requires analysis and ‘un-picking’ of old tunes to see how ( and why) they work. Bringing together simple, gentle asanas, based on hatha yoga practice, and chants, rounds and meditational songs. Through this holistic approach, the whole body is brought into the singing process, and the singing enables the body to maintain the postures for longer and with more ease . The sessions begin with yogic breathing patterns which calm, focus and extend lung capacity. Workshops can be constructed for any level of experience. Starting from absolute first principles ( using existing, well-known pieces as examples eg ‘When I First Came To This Land’ for rhyming practice, ‘Geordie’s Penker’ for narrative etc. ) we explore how a wide variety of song genres work, doing short writing exercises to build up skills. We examine how many songs we all actually know already, that we can use as role models ( hymns, nursery rhymes, pop songs, folk songs, advertising jingles and so on and on) and write parodies, again to build writing skills. Writing from actuality- telling other people’s stories in song, having interviewed them and captured the essence of their ways of relating experiences.